In the analysis software it is possible to have 500+ variables at any one time, however, while in some applications this is required, for most applications far fewer variables are needed. The more variables that are active in the software the longer the list to select from in all the objects, and generally the less friendly the software is to use � so generally it is desireable to activate only the variables that are really required. There are 2 different ways to enable variables. They can either be automatically enabled when they have data, or they can be manually activated. Whether variables are manually or automatically activated is set under the General Options tab, in analysis options. There is more information about these options here. Note that if variables are automatically enabled, then it is not possible to activate and deactive variables from the variable manager. A tick indicates that the variable is active and it will be available for use throughout the software. Clicking on the particular variable property brings up the relevant dialog box so the property can be edited. For example clicking on sensor type/units allows the units for that variable to be edited. 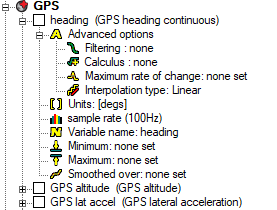 For example on the speed variable you can select whether to display speed in mph or kph. Native units are displayed on the side. There is also the facility for a custom transformation which typically allows the user to enter a particular formula to convert from the native units. There is more information about custom transformations here. The Smoothed over option will allow you to set a time for the program to smooth over. Please note, that this will not create any lag on the smoothed values. The value you enter for the smoothing will be a time, the smoothing will be done by averaging the values half this time before and half this time after the point the software is working out. Please note that if you enter a large value, this will become slightly inaccurate.